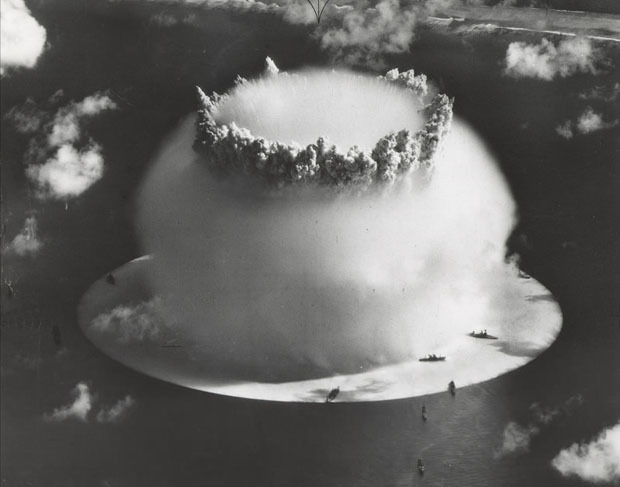 In 1946, the United States conducted a series of nuclear weapon tests at Bikini Atoll in what’s known as Operation Crossroads. 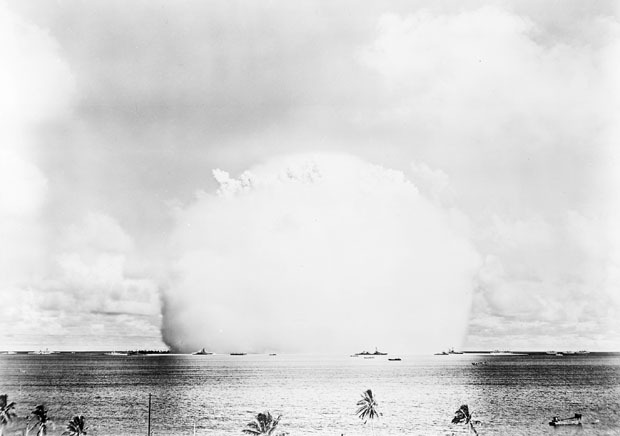 A total of two bombs were detonated to test the effects nuclear blasts had on naval warships. 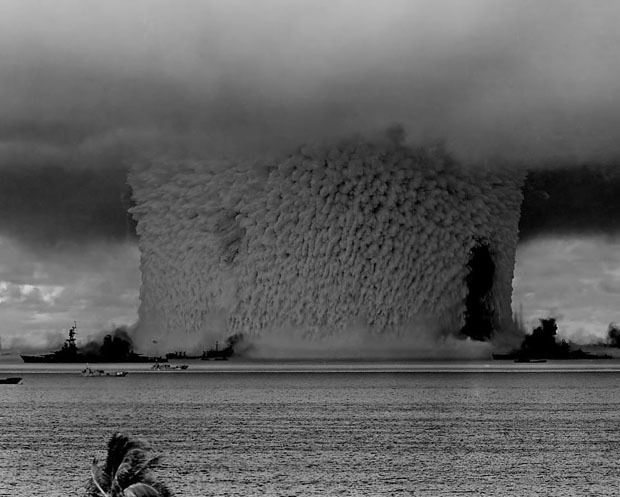 The second, named Baker, was the world’s first nuke to be detonated underwater. 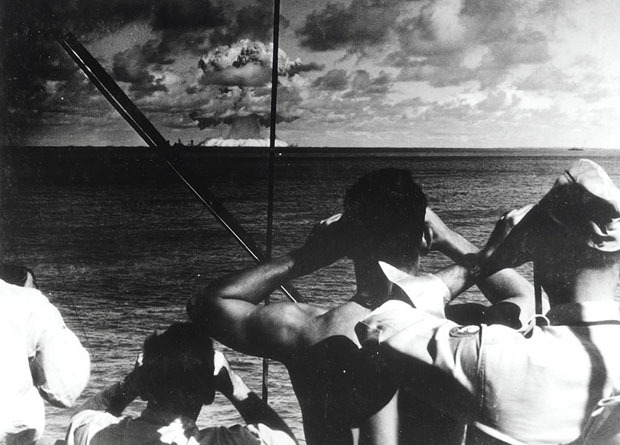 Due to the unique properties of underwater explosions, the Baker test produced a number of unique photographs that the world had never seen before. The blinding flash that usually obscures the target area took place underwater and was barely seen. The clear image of ships in the foreground and background gives a sense of scale. The large Wilson cloud and the vertical water column are distinctive Baker shot features, making the pictures easily identifiable. 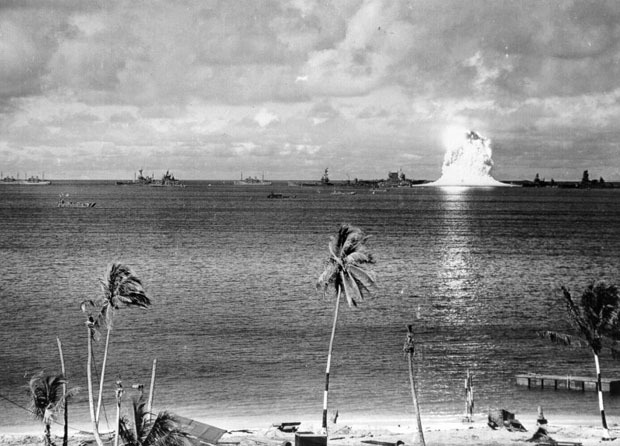 18 responses to "Photos from the World’s First Underwater Nuclear Explosion"
Anyone who looks at these photos and still believes there is hope that the human race is not going to make itself extinct must be in deep denial. The video footage is equally stunning. I think the 2002 Tsunami that killed over 100,000 Muslims was started with an underwater nuclear explosion in the Sumatra Trench. That's why the information on the epicenter was moved 500 miles to the north. UGH.. and now who owns them? they call them selves civilized . Uncivilized is the use of nuclear weapons. That will teach those pesky whales! Inexcussable horror! Surely those observers got a dose of radiation they didn't forget. Unfortunately so did all the sea life and those anywhere around or around where the water would be carried by the Gulf Stream. NO wonder Eugenia Clark write about our oceans being polluted. This is about as insane as blowing up the moon with an atomic bomb back in Carl Sagan days. Thanks for the pictures to wake us up! First, the footage was unbelievably cool. Second, doing thus was the stupidest idea in history. I have never seen such proof that humans are complete catastrophes for this planet. Every American should hang their heads in shame for allowing the satanic federal government to destroy the world. Patriotism means hating the US government. I love The Constitution, not the whores who run our lives. @person who said you never saw damage to the ships -- take a look at picture #2. Look at the right edge of the 'vertical water column'. See that vertical black thing? That would be the battleship USS Arkansas. 27,000 tons. At 562 feet long, the battleship was 3 times as long as the water was deep. Was also the 2nd closest ship there to ground zero (was only 170 yards away from ground zero). After the Wilson cloud lifted, the Arkansas was seen with its bow pinned to the sea floor, with what was left of its stern sticking straight up 350 feet in the air. She then toppled backward (upside down) into the water curtain of the spray column. 27,000 _tons_ of steel, casually tossed in the air as easily as a Kleenex. To quote a certain "Joshua" (talking about a little something called Global Thermonuclear War), "the only winning move is not to play." what prompted this post, i wonder? 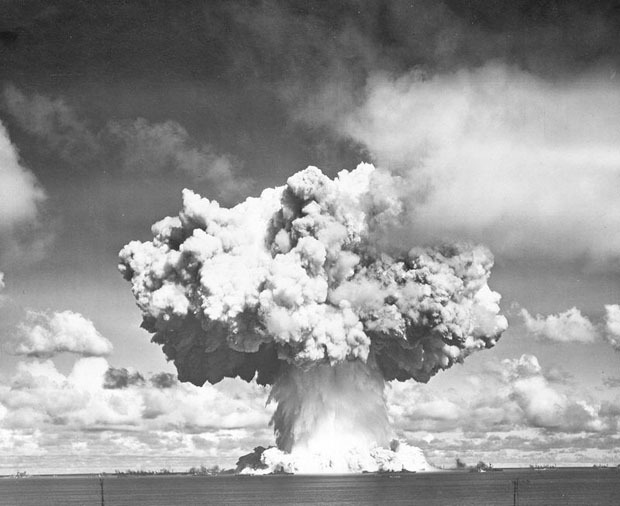 the ships, and the aircraft, involved in this and subsequent Bikini Atoll tests, after a first (largely unsuccessful) first pass at 'decontamination,' ended up at the Alameda and Treasure Island bases for decommissioning -- i forget which went where. 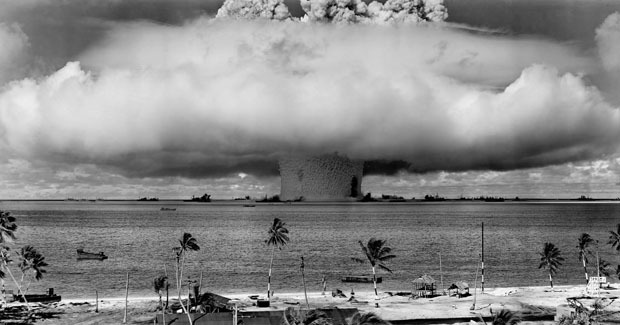 the people of Bikini Atoll are only very recently receiving any compensation. that would be the descendents of those irradiated during these tests. no doubt Alameda will too some day. both Alameda and Treasure Island have upper-crust-targeting developments making use of the viable real estate. no one expects kids to play in dirt anymore i guess. in all three cases a wildlife refuge suspiciously guards other real estate from human interaction. just some odds and ends. be seeing you.